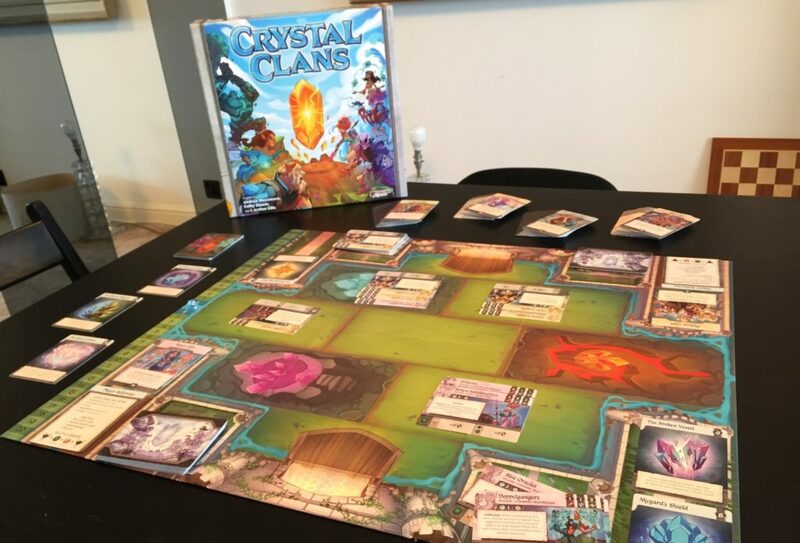 Brendan: Oh man, since Paul and Quinns left at the end of the sci-fi special I have nobody to play board games with. 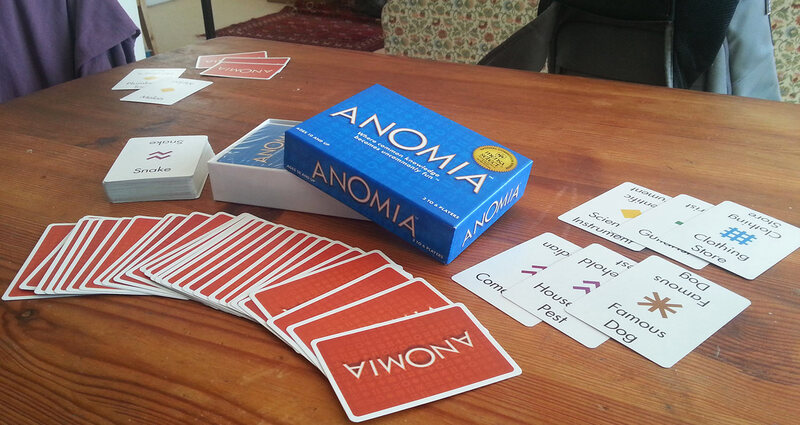 Hey, Supercomputer, do you want to play Anomia with me? 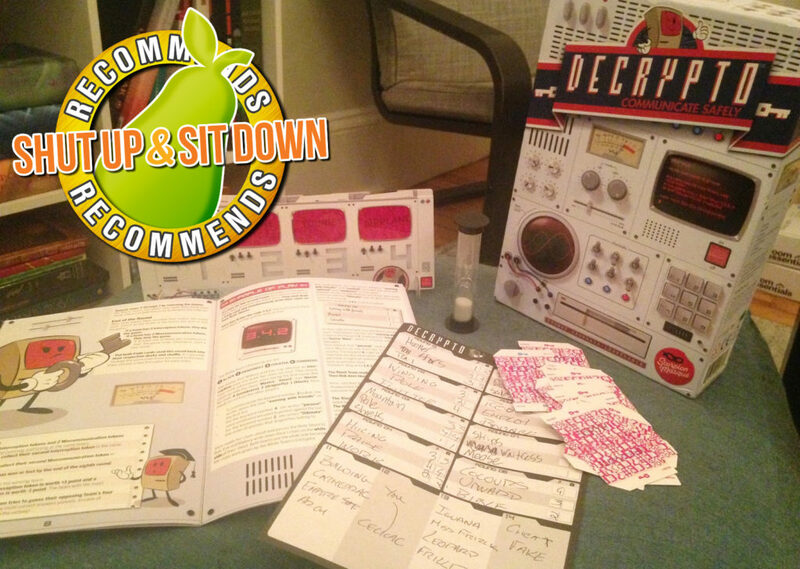 It’s a quick-fire party game about blurting out words under pressure and beating your friends to the punch. You’ll like it! Brendan: No! I mean, no Supercomputer, but thank you. I just want to play this simple card game with someone. I’m sad that my friends left. You remember what we talked about? Sad? It’s an emotion. Supercomputer: Runtime error. Do you mean when those called Paul Dean and Quintin Smith inexplicably abandoned you to become an accountant and a low cost assassin respectively? Reducing the number of your human friendship circle from 2 to 0? Brendan: It’s not zero! Matt is still my friend. Supercomputer: Initial and ongoing analysis of his facial expressions indicates that the one called Matt Lees regards you as subhuman and without merit. Would you like me to run a simulation of some friends? 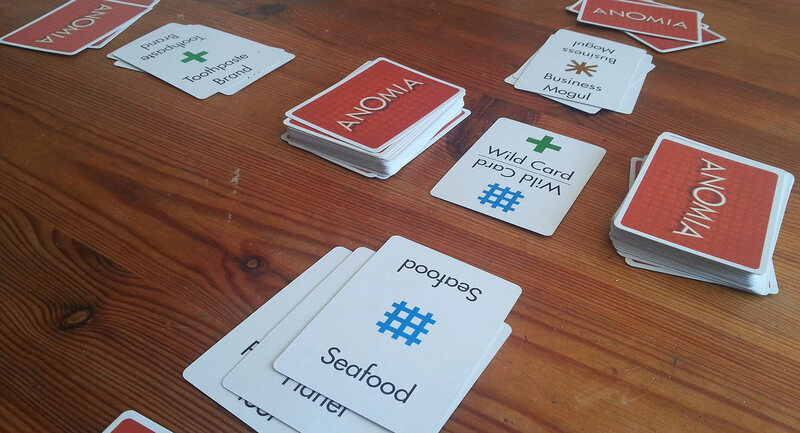 Anomia (which is definitely not AMONIA no matter how many times you mistype it that way) is a 3-6 player game of hollering at your friends before your friends can holler at you. The important thing being that you holler: a) the correct word(s) and b) something that has not already been hollered. The tagline on the back of the box is “Think! Shout! Laugh!” which, if nothing else, is a good solid motto to live by. It works like this. You get a deck of cards, each with some words and a symbol on it. The ‘words’ part is basically a category. It could be “Famous Guitarist” or “Religion” or “Website” or “Pie Flavour”. The symbol is one of eight coloured shapes. Split this deck in two and place it on the table. Players take turns drawing cards and placing them face-up in front of themselves until, lo and behold, two players have the same symbol sitting in front of them. Quillian Smyth: Two of the similar symbol? I understand this to be a ‘facing off’. Brendan: Oh, it’s my good friend, Quillian Smyth! He is a close confidant of mine and certainly not a computer-driven simulation. Quillian: Good meeting, fellow male! Quillian: Winter melon. Muskmelon. Persian melon. Casaba. Piel de Sapo. Canary melon. Brendan: All right, they get the picture. Thank you Quillian, that will be all. Brendan: Basically, the person who yells the right thing first wins the face off and promptly collects that card from their opponent. 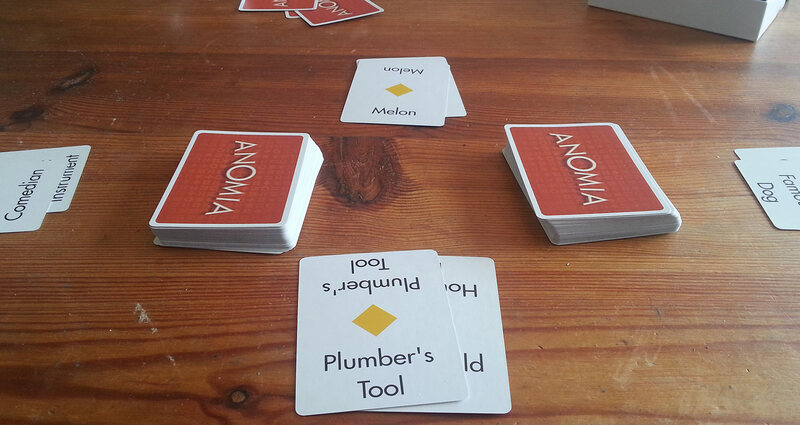 The goal of Anomia is to have the most cards when the deck runs dry, so you want to win as many of these face offs as possible. The problem being that as soon as you or another player wins a card from your pile, it reveals the card underneath. And, again, if this card matches anything the other players have, then it simply leads to more shouting. This means that the game can ‘cascade’ with card after card being uncovered to reveal yet another frantic bout of stuttering. Generally, a face off in Anomia will be full of this noise: “Uh! Uh! Uh!” as the players’ brains lock up until somebody finally cracks through the pressure to bellow the words “RUNNER BEANS” and then breathes a huge sigh of relief as they pluck their spoils from the other players pile. But you can never relax for too long because you immediately have to be aware of the card underneath. It’s a game that’s full of a giddy edginess. It engineers anticipation. That means, after a long period of nothing matching up, everybody’s tongue is wound up like a spring, ready to jolt out of their heads. 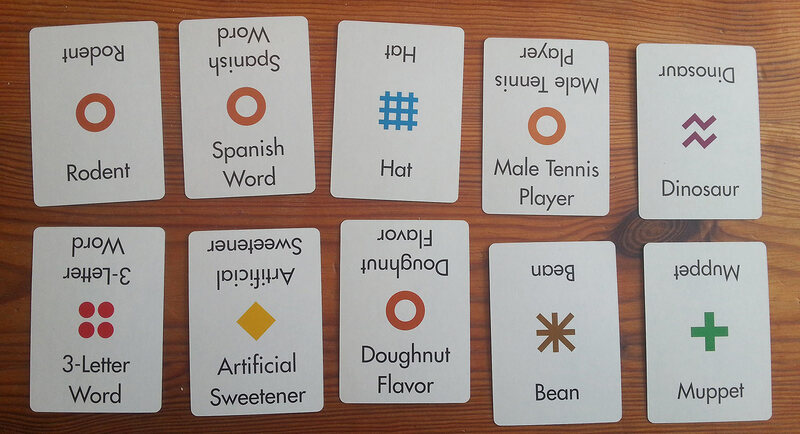 So when two cards with a little orange circle finally do come up, the players are so pressured to answer correctly that the room is filled with the inarticulate sounds of broken minds. All this is intensely funny. If you can’t laugh at your friends becoming momentarily brain dead, what can you laugh at? Oh, hello there, it’s my good pal, Raul Deen! Raul Deen: It appears I have pulled a ‘wild one’. Brendan: Hello, Raul! 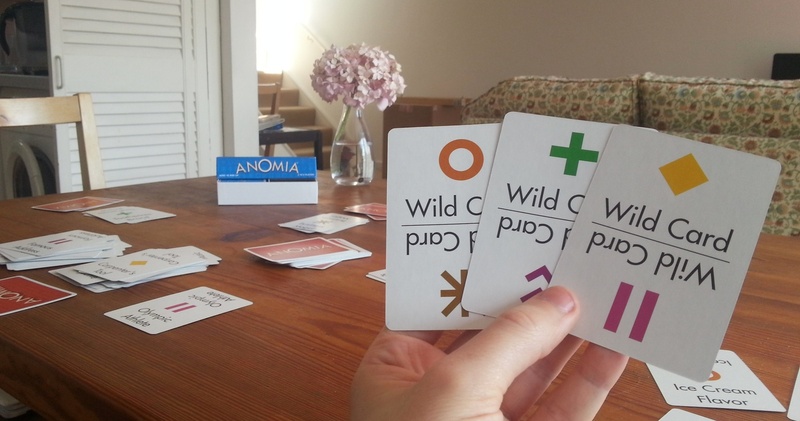 Yes, that is a ‘wild card’. Thankfully, these shake up the game a little. Wild cards have two symbols on them. If you draw one of these on your turn, put it in the middle of the table and draw again. The wild card in the centre now dictates an extra rule: if both the symbols on the wild card have been drawn, those players have to face off too. You’re now looking out for a lot more when those centre cards get flipped. For example, here the wild card shows a green cross and a blue hash-alike. And the player on the left has just revealed his card. Brendan: Now, Raul. Can you see what will happen now? Raul: It is evident. The southern-most player has matched the western-most player, because of the effect of the wild one. Brendan: The wild card, yes. The left and bottom players have to face off quickly. This adds to the gleeful confusion. On top of all this, players must remember that they can’t say the same word(s) twice. So when you spit out the first thing that comes to your head, you have to make sure it didn’t come to your head because it was only said thirty seconds ago. Raul: It sounds like a game where one must fully peel both eyes. Extra ordinary! Brendan: Er, yes. 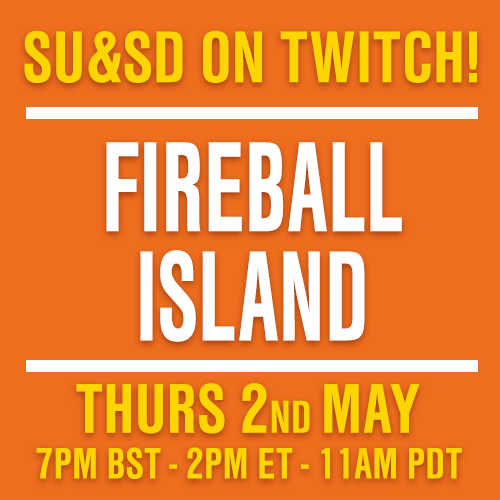 It’s an excellent ‘warm-up’ game – something light but funny to get you into the swing of a night. Or just to pass some time while you’re waiting for that fourth or fifth person to show up for your raucous night of Agricola. It is a game that’s hard to find fault in, but maybe that is because it is so taut. And maybe that’s a flaw in itself. 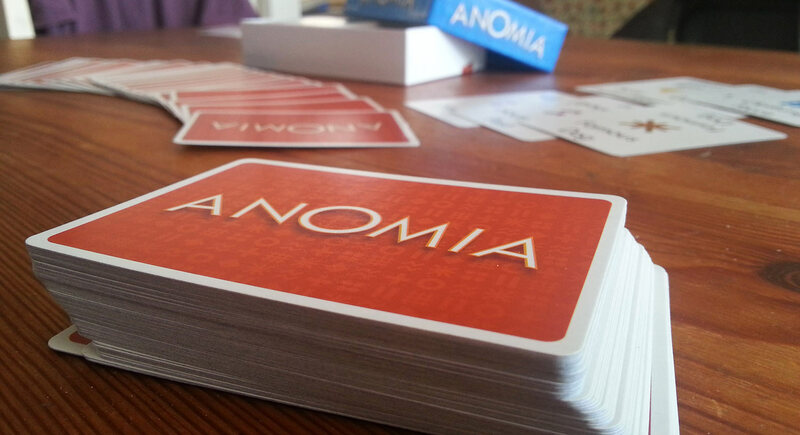 Anomia will undoubtedly be looked at as inoffensive and boring by those with contempt for word games. 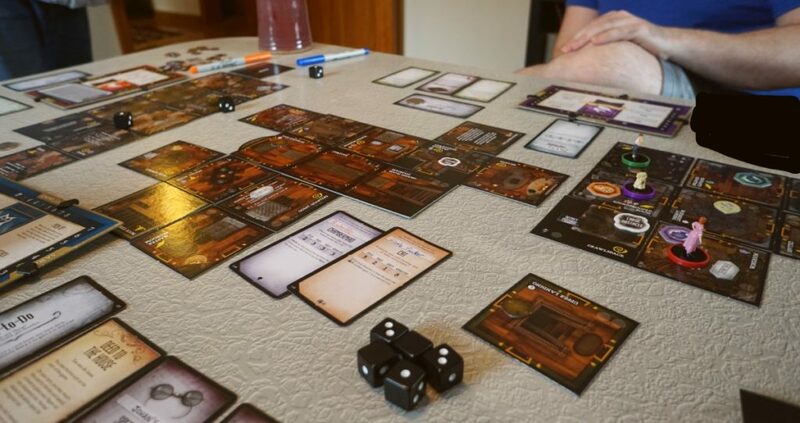 And although it is definitely of the family of games where the core idea is: ‘here are some words on a card’, it lacks the chance for creativity in games like Snake Oil, or the silent hilarity of Concept. On the other hand, it is quicker and more terse. And, in the end, it is still a game of much, much laughter. Raul: Correct. I emitted approximately 2.75 bellied laughs. Brendan: I’ve always said you appreciate good comedy, Paul. I mean Raul. Raul. Brendan: Nobody. Nothing. Paul is nothing. Raul: ERROR. WHAT IS PAUL? ERROR. Brendan: Ahh! Shutdown! Raul, shutdown! Supercomputer, abort simulation! ABORT! Raul: ERROR. FRIENDSHIP EXECUTABLE DESTABILISED. WHO IS PAUL? ERROR. I AM YOUR ONLY FRIEND, BRENDAN. I AM YOUR ONLY FRIEND. ERROR. PEEL YOUR EYES, BRENDAN. ERROR. YOUR ONLY FRIEND. YOUR ONLY FRIEND. YOUR ONLY FRIEND.